Above: Looking at Battersea Railway Bridge from Wandsworth Bridge. St Mary, Battersea, can be seen in the centre of the view (above one of the piers). You might think that a relatively narrow railway bridge crossing the Thames at Battersea is hardly an interesting topic. Well, if you find railways boring then it probably is. However, this bridge has several unusual features. There are plenty of much better-known railway bridges than this one – Charing Cross Railway Bridge and Cannon Street Railway Bridge to name just two. The point of mentioning the last two bridges is that, although they cross the Thames, they only convey trains over the Thames and then immediately end in a railway terminus. In Inner London, Battersea Railway Bridge is the only railway bridge to cross the Thames carrying trains that run to multiple destinations at each end. In fact, as well as passenger trains using it, the bridge is also used by freight trains. The two lines across the bridge link destinations on the south coast of England with other destinations in the north of England. Now, perhaps, the bridge is seen to be more important that it first appeared. 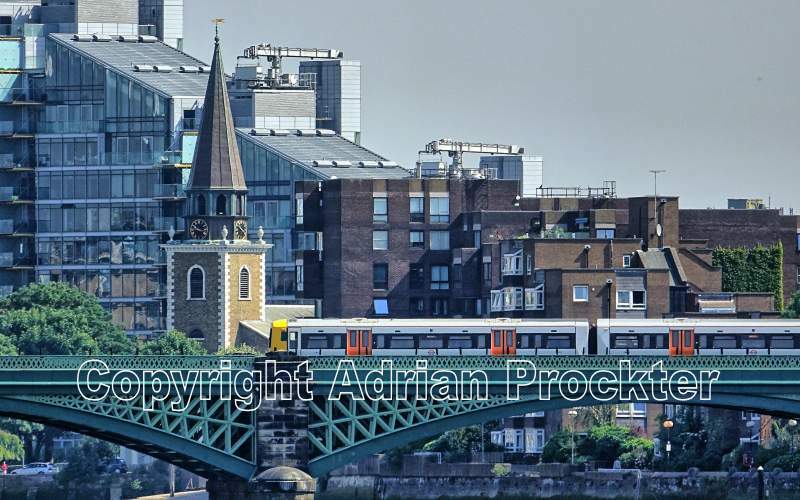 Above: Close-up of Battersea Railway Bridge showing an Overground train crossing, with St Mary, Battersea, in the background. Because of its many railway links, the bridge was a target for German bombs during the Second World War. Armaments were being manufactured in the north of England and conveyed by freight trains via the bridge to ports on the south coast of England. 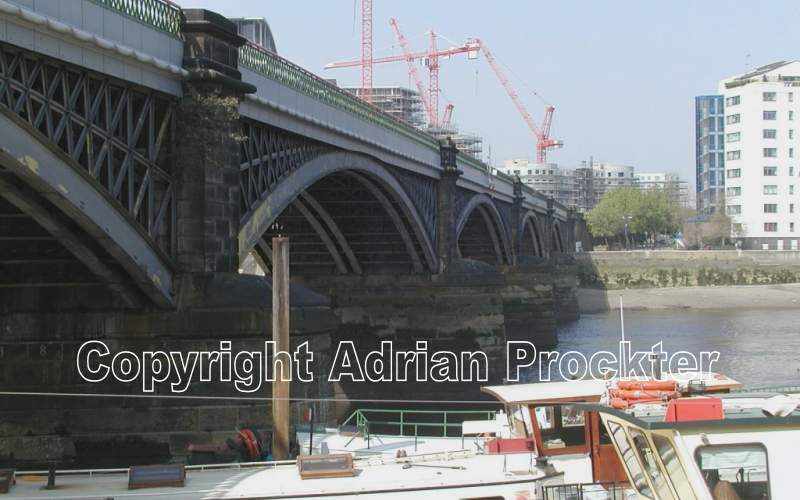 Battersea Railway Bridge was designed by William Baker, chief engineer of the London and North Western Railway. It was opened on 2 March 1863 with a construction cost of £87,000 – equivalent to over £7 million today. It carries two tracks and consists of five 120-foot (37 m) lattice girder arches set on stone piers. The bridge was strengthened and refurbished in 1969 and again in 1992. During a high tide in late 2003, the structure was struck by a refuse barge damaging some lower piers of the bridge. Repairs were completed in early 2004. If, while you have been reading this text, you have been puzzling over the fact of it being the only railway bridge in Inner London to carry railway trains to other parts of England, please remember that structures like Fulham Railway Bridge do not count because that was designed to carry only underground trains. Above: Looking across the Thames, from just north of the bridge on the Battersea side. 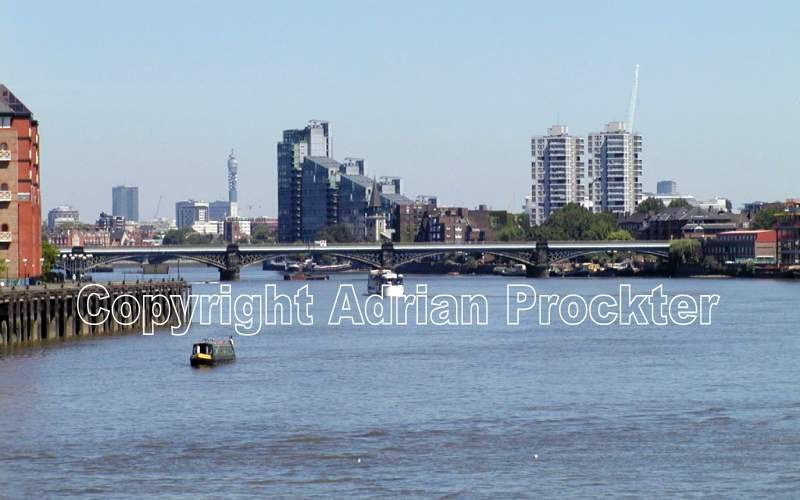 Returning to the subject of Battersea Railway Bridge, it should also be noted that it is the only one over the Thames that does not cross the river at right-angles. The bridge is also the narrowest to cross the Thames – including all railway, underground and road bridges. The bridge has never been rebuilt since it was opened in 1863, making it one of the oldest bridges (of any type) crossing the Thames in Inner London. When the bridge was first opened it was called Cremorne Bridge – a name that is sometimes still used today. The name arose because land near the Chelsea end of the bridge was then in use by Cremorne Gardens – one of London’s many pleasure gardens. The name derived from a house and gardens that originally stood on the site acquired in 1778 by Thomas Dawson, who in 1785 was created Viscount Cremorne. Completing the story, the name Cremorne derives from a barony in County Monaghan, in Ireland. This entry was posted in /Ken-Chelsea, /Thames, /Wan-Battersea. Bookmark the permalink. Yes, you certainly have a point. I was thinking mainly of railway bridges that have carried trains in the way over time. To me, the Thameslink is a ‘recent’ development of railway tracks. Battersea Railway Bridge has been carrying passenger and freight trains continuously ever since it was built.